Money problems can cause a lot of stress in a marriage, but the last thing you need to do is let your finances cause you to stop communicating. If you're both spending but you're not discussing how much and on what you're spending, things can quickly spin out of control. Sit down with your bills, figure out what to pay, what you can spend on expenses and then set limits together. Communicate clearly if you go over limits and work together to get back to rights. Sit down each week and figure out which bills you must pay that week, how much money you've got coming in and how much that leaves you for living expenses. Set a budget for the week and then check in every day or two to make sure you're still on track so you have time to make adjustments before things get out of hand. It can be harder to budget more than a week in advance when you're just getting by, but even a short term budget is better than none at all. Dave Ramsey recommends the envelope budget method but if you prefer to use your debit card for most expenses, you can use a modified method to track your budget by category. Label an envelope for each category like food, fuel, toiletries, etc and write down the budget amount for that week based on your available money. Instead of taking cash out of the envelope to pay, swipe your card and then get a receipt. Place the receipt in the envelope. This lets you track by category as well as overall. If you're living paycheck to paycheck, it's a good time to look at how you spend your money to see if there are any obvious ways to cut your budget. If you smoke or drink daily, that's a serious expense. Ditching your vices can add hundreds of dollars back into your budget each month. You may also need to cut back on cable, car pool to save on gas and brown bag it for lunch instead of eating out. It can be painful to trim, so look for places you're blowing cash first before cutting into other expenses. When you end up with a windfall like a tax refund, bonus from work or birthday money, it can be tempting to treat yourself with a splurge like a night out or something you've been wanting to buy. Instead of blowing the money, consider tucking it away in a rainy day fund so that you've got a little buffer for emergencies or unexpected bills. It can be tempting to spend the sum, but the peace of mind of having a nest egg can be much better than whatever you're consider treating yourself to. If you're tired of living paycheck to paycheck, never being able to take a vacation, eat out or just have breathing room in your budget, it may be time to take a more drastic step to get yourself a financial fresh start. If you have loads of credit card debt, medical bills you can't pay, are being sued for unpaid debts and are being hounded by debt collectors, Chapter 7 bankruptcy is a serious debt relief solution that can get much of your debt eliminated. 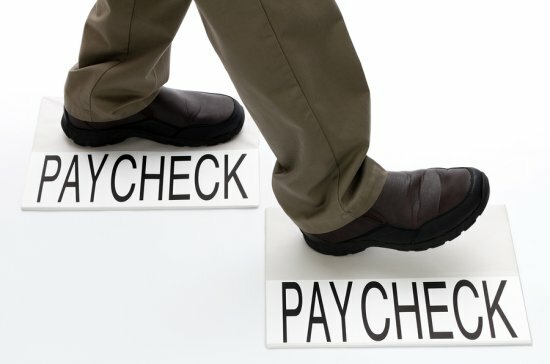 To find out more about how bankruptcy can help you put an end to the paycheck to paycheck cycle, contact the law offices of John T Orcutt for a free consultation at one of our convenient North Carolina locations.